If you haven’t read much in the way of self-help/personal development and want to learn some simple but powerful lessons on optimism, positivity, goal setting, and creativity, then you want to read this book. 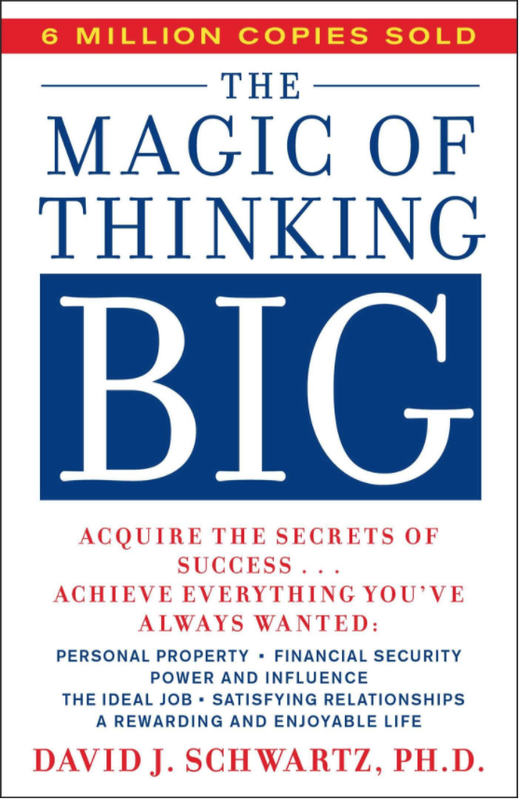 Okay, let’s get to this week’s book: The Magic of Thinking Big by David Schwartz. There are two distinct types of self-help books: the analytical, “left-brain” books that offer science-based actions and formulas for betterment, and the whimsical, “right-brain” books that are more like fireside chats with wise old mentors who have illuminating experiences and stories to share. This book is the latter, and one of the better ones of this type that I’ve read (and I tend to not like these types of books). I don’t want to oversell it and put your expectations too high, but I’m recommending it because quite a few of its key ideas are spot-on and actually validated by science. Most of them probably qualify as common sense, but the same can be said of most things that make for good living. The trick isn’t just understanding these ideas intellectually but internalizing and organizing our lives around them, the initial impetus to do this often comes down to timing and delivery. You can come across an idea that, if accepted and acted upon, would completely change your life, but if you’re not ready to accept it or if it isn’t communicated persuasively enough, you won’t give it a second thought. On the other hand, if it’s communicated at just the right time and in just the right way, it can ring you like a bell and motivate you to get into action and transform your very being. I can’t promise this book is going to do that for you, but it is a book that has that potential, and that’s why it has sold millions of copies and continues to top bestseller charts today. Excuses are seductive. They promise freedom from pain, embarrassment, and failure. They lull us into letting ourselves off the hook. Without excuses, we have to face the things we don’t want to face and do the things we don’t want to do. We have put ourselves out on the line every day and prove that we’re still worthy of our station. Without excuses, having done and been is never enough. We have to continue doing and becoming, continue living up to our standards. Hakuin Ekaku was one of the most influential figures in Japanese Zen Buddhism, and here’s his take on this: “It’s like chopping down a huge tree of immense girth. You won’t accomplish it with one swing of your axe. If you keep chopping away at it, though, and do not let up, eventually, whether it wants to or not, it will suddenly topple down. When that time comes, you could round up everyone you could find and pay them to hold the tree up, but they wouldn’t be able to do it. It would still come crashing to the ground…. But if the woodcutter stopped after one or two strokes of his axe to ask the third son of Mr. Chang, ‘Why doesn’t this tree fall?’ And after three or four more strokes stopped again to ask the fourth son of Mr. Li, ‘Why doesn’t this tree fall?’ he would never succeed in felling the tree. Decades of psychological research has demonstrated that we construct our worldview based on what we pay attention to, not what is. Who we are, what we think, feel, do, and love is the sum of what we focus on. To fully appreciate this, let’s do a personal experiment. Take a moment to observe your physical surroundings, and for the next several minutes, look around and ask yourself a few questions, paying attention to how it impacts your mood: What’s right about this environment? What am I okay with? What can I enjoy, admire, and even celebrate? As you’ll see, it doesn’t take much of this before your heart begins to warm. Bask in the good vibes you’ve created for a minute, and then, let’s turn them off by doing the opposite. This time, look around and find what’s wrong with your current environment, what bothers you, and what should be improved (and if you want to spoil the fun even faster, consider who’s likely to blame for all of it). Notice how quickly the glow fades? Objectively speaking, nothing has changed between these exercises. You’re still occupying the same space and surveying the same environment, which still contains things that are both wonderful and woeful. How you feel about these realities, though, is determined by your frame of mind. Choose to see the good and you will feel good; choose to see the bad and you will feel bad. The point here is we have a surprising amount of control over our emotions, and can “turn on” positivity almost whenever we want by simply controlling our attention. Many people don’t think of themselves as particularly creative individuals or even capable of creative thinking, but that’s nonsense. If you feel this way, it’s simply because you haven’t cultivated habits that are conducive to creativity and practiced the creative process, not because you’re just wired poorly. Every one of us can be creative if we’re willing to work at it, and most of that work comes down to exposing ourselves to a wide variety of inputs and stimuli, entertaining new and different ways of analyzing situations and circumstances, and searching for new and interesting ways to combine disparate elements into unique concepts, solutions, products and services, and so forth. Have you read The Magic of Thinking Big? What did you think? Have anything else to share? Let me know in the comments below!